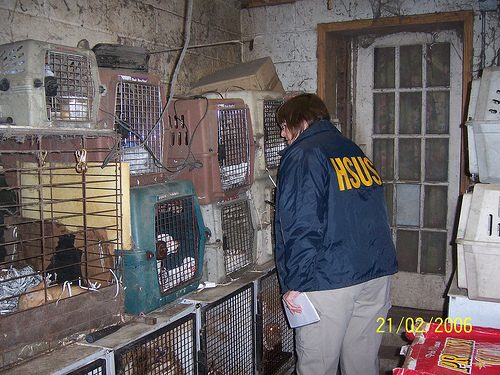 Close Puppy Mills - What is a puppy mill? What is a Puppy Mill ? 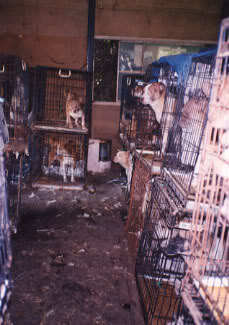 Puppy mills are shameful, for profit only, mass breeding operations. There are thousands of puppy mills all over the country owned mostly by farmers & the AMISH, with the greatest concentration in Missouri, Oklahoma, Pennsylvania, Iowa, North Carolina and the Midwest. To maximize profits the puppies are taken from their mothers far too early and trucked all over the country to pet stores and brokers. The result is almost always without exception, sick puppies who will suffer and puppy owners who will pay the price with their heartbreak and their wallets. For their entire lives, puppy mill dogs are kept in wire cages barely bigger than their own bodies and they are bred non-stop. Most never even see the light of day or experience the feel of soft grass or solid ground beneath their feet. Even the most basic of needs are denied them. Countless dogs have been found imprisoned in their cages dead or dying from starvation, dehydration and disease. Constant neglect and filthy living conditions lead many to suffer without end from open weaping sores caused by incessant fly and flea bites. 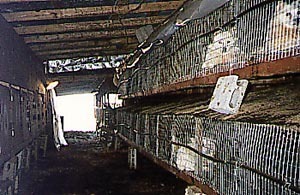 Even protection from the elements is not provided since their caged enclosures are not heated or air-conditioned. Thus they must endure the bitter cold of winter and the sweltering heat of summer with no relief. And with no hope of escape, they are trapped in these deplorable conditions. Without any humane regard at all for these helpless dogs, painful surgical procedures such as cesearian sections are done by the 'millers' (who are usually farmers) with no benefit of anesthesia. In order to hide their dirty secret the millers often debark the dogs to stop them from crying out in misery. Commonly a pole or other long object is repeatly jammed down a dogs throat in order to sever the vocal cords. Broken jaws and even death often occur as a result. Sadly, when no longer able to produce puppies for profit, the helpless dogs are abandoned or unmercifully dragged from their cages and killed. These dogs will never experience human love or companionship or even the simple joy of a toy or a treat. This is the unspoken truth behind the cute puppies in pet stores and on the internet. This horrible treatment inflicted upon man's best friend is unconscionable. Until the demand for the puppies is no longer there, these dogs will continue to suffer helplessly at the hands of the greedy and immoral. *You can view actual video of puppy mill RESCUES by clicking on the links below*. WARNING: Please be aware that the images may be upsetting but they are unfortunately very real.